Every year, the frozen Arctic Ocean emerges from winter and thaws under the 24-hour light of the summer sun. Each year is different: sometimes ice retreats from the shores in dramatic fashion and other years have a more gradual melt. 2011 proved to be a year of extreme melt. By early September, the area covered by sea ice in the Arctic Ocean was approaching a record low. This animation shows the melt during the summer of 2011. (Click the link below the image to download.) The animation was made with measurements taken by the Advanced Microwave Scanning Radiometer–EOS (AMSR-E) on NASA’s Aquasatellite between March 7 and September 9. The final image in the series, shown above, shows the sea ice at it lowest point so far this season. Most notably, the Northwest Passage, the sea route that threads through the islands of northern Canada to link the Atlantic and Pacific Oceans, is entirely ice free. Twice-daily images provide glimpses of the open water in the Northwest Passage throughout September. On September 9, the sea ice extent was very close to the record low set in 2007, according to the National Snow and Ice Data Center (NSIDC). Scientists at the University of Bremen, who use a slightly different method to calculate sea ice extent from AMSR-E measurements, declared that 2011 surpassed 2007, setting a new record low. 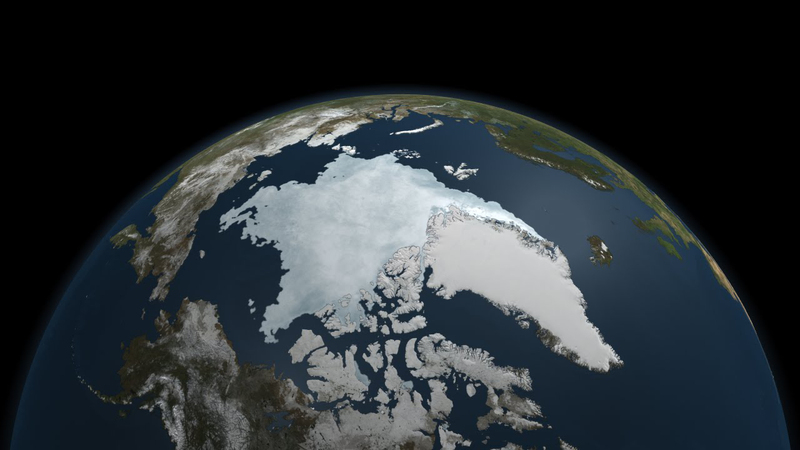 On September 9, sea ice covered 4.33 million square kilometers (1.67 million square miles), NSIDC reported. The 2011 low is 2.38 million square kilometers (919,000 square miles) below the average minimum extent measured between 1979 and 2000. Late season melt or a shift in wind patterns could still decrease the sea ice extent before the winter freeze-up begins. In 2007—the last time sea ice reached similarly low levels—conditions were ideal for melt. Skies were clear, wind patterns thinned the ice, and warm air temperatures melted the ice. Weather patterns in 2011, by contrast, were typical. This means, NSIDC scientists say, that the ice was thin and spread out before the melting even started in the summer of 2011. It is a sign that Arctic sea ice is thinning. Indeed the last five years include the five lowest sea ice extents since records began in 1979, and much of that trend has been caused by global warming, says NASA Cryosphere Program manager Tom Wagner in his video interpretation of the 2011 sea ice record (43 MB MPEG-4). 2. Kay, J.E., Holland, M.M., Jahn, A. (2011, August 11). Inter-annual to multi-decadal Arctic sea ice trends in a warming world. Geophysical Research Letters, 38, L15708. 3. NASA Goddard Space Flight Center. (2011, September 15). Arctic sea ice nears 2011 minimum. Accessed September 21, 2011. 4. National Snow and Ice Data Center. (2011, September 15). Arctic sea ice at minimum extent. Accessed September 21, 2011. 5. National Snow and Ice Data Center. (2010, October 27). Sea Ice. Accessed September 21, 2011. 6. Leitzell, K. (2011, August 24). Climate change or variability: What rules Arctic sea ice? National Snow and Ice Data Center. Accessed September 21, 2011. NASA image and animation courtesy Scientific Visualization Studio at NASA Goddard Space Flight Center. Caption by Holli Riebeek.